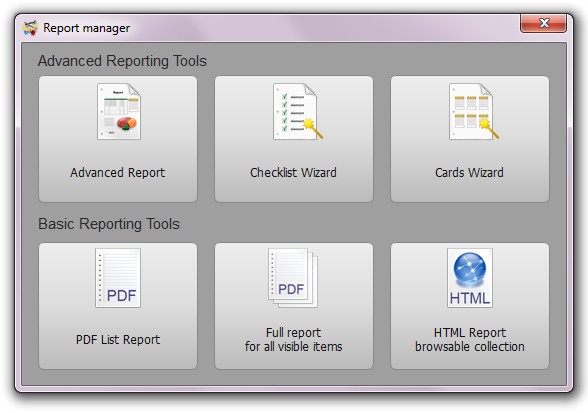 Use menu 'Tools' -> 'Report' to open Report Manager. PDF List Report - Generate a table list report for all visible items in the same order as in the List view. Use TAGs and Filter to arrange and choose items for the report. Arrange the column’s order in the List view before starting report generation. Full report - Generate a PDF report with all visible items using the same layout as for Details view. It can be used as PDF export for selected items. Select items, click right mouse button to popup menu with options. Click 'Save to PDF’. HTML Report - Generate browsable HTML website for all visible items. Use TAGs and Filter to arrange and choose items for your report. Arrange the column’s order in the List view before starting report generation. It can be used as HTML export for selected items. Select items, right-click your mouse to popup menu with options. Click 'Save to HTML'.